Over its 26 years as an annual event, Christmas at the Palace has become a community favorite in Santa Fe and, for many families, the true kick-off to the holiday season. The event begins with Native drummers beneath the Palace Portal, offering a welcome-to-the-Palace prayer. People gather to listen (and sometimes shiver as the snow falls) while awaiting the arrival of Mr. and Mrs. Claus and their clutch of real elves. Then everyone enters the Palace (no admission fees tonight!) 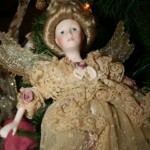 to wander the exhibits, listen to local performers, sample bizcochitos and hot cider, and take a turn on Santa’s knee. On Monday, workers pulled hay bales into the Palace Courtyard in preparation for Santa’s arrival. Garlands were hung over Palace doorways, trees were decorated, and more than a few trips up and down rather tall ladders were required. 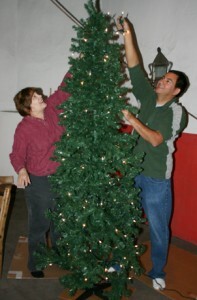 One of the favorite parts of the holiday decor is what Palace volunteers and staff think of as “Dee Johnson’s tree.” Before her untimely death, the former first lady of New Mexico gave the museum a collection of tree ornaments hand-crafted by New Mexico artisans. Dee Johnson’s tree is in what we call “The Green Room” — the room to the east of the Palace’s main entrance where the architectural history of the building is detailed. Other trees in the Palace include lovely Victorian ornaments, parrots and doves, reindeer, and a cathedral or two. 5:30-6:30 pm: Coro de Agua Fria. Traditional Christmas carols in Spanish in the Palace Courtyard. 6:40-7:30 pm: Schola Cantorum. Santa Fe’s sacred music ensemble. Why does it matter? The first known European chronicles describing the lands and native peoples of what is now the United States were written not by pilgrims but by Spanish explorers. Spain’s presence on the continent evolved over 309 years—from April 12, 1513, when Juan Ponce de León took possession of the Florida coast for the king of Spain, to 1822, when a newly independent Mexico lowered the Spanish flag in California. Created in Spain, The Threads of Memory explores a heritage that most Americans missed in their American History classes. Many of today’s issues – immigration, land grants, cultural traditions, and complex interrelationships among cultures – can be traced to how our predecessors responded to Spain’s role in the American story. When history books too often told the American story from an east-to-west point of view, the role played by Spain faded into the background, if it was even mentioned at all. Many of us were taught how important France’s aid was to achieving U.S. independence, but far fewer know that Spain’s financial aid essentially underwrote the American Revolution. We also know that President Thomas Jefferson purchased Louisiana from France, but we may not know that, just one month prior, Spain had ceded Louisiana to France. 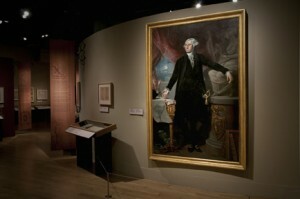 The exhibition is organized in 10 sections, including the first accounts of geography; the development of missions, forts, roads and cities; land exchanges among Spain, France and the United States; the threat from Russian exploration and colonization; and the Revolutionary War. 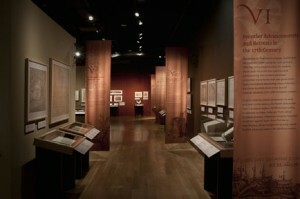 The exhibit includes details of Spain’s explorations and settlements in modern-day Florida, Louisiana, Texas, New Mexico, California and Oregon. We encourage teachers and homeschoolers to take advantage of the opportunity to fill in the gaps. The lesson plans are geared to a variety of age groups, encourage individual and group work and provide an early learning lesson in the importance of working with original documents. The Threads of Memory: Spain and the United States (El Hilo de la Memoria: España y los Estados Unidos) is sponsored by the Fundación Rafael del Pino and, along with the Archivo General de Indias (General Archive of the Indies), and is co-organized with SEACEX (Sociedad Estatal para la Acción Cultural Exterior), in collaboration with Spain’s Ministries for Foreign Affairs and Cooperation and Culture. The exhibition and lecture series are presented in New Mexico with special support from BBVA Compass Bank, the city of Santa Fe, Wells Fargo Bank, Heritage Hotels, Santa Fe University of Art & Design, the Museum of New Mexico Foundation, the Palace Guard, and many individual donors. 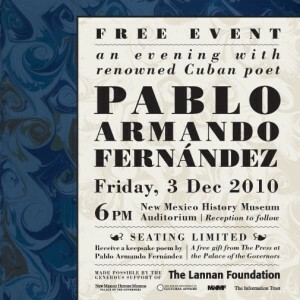 Thanks to the generosity of the Lannan Foundation, what was to be a $20-a-head fund-raiser for the Palace Press is now a free evening of poetry and conversation with renowned Cuban poet Pablo Armando Fernandez. Come to the museum at 6 pm, Friday, Dec. 3, to enjoy this legendary writer. Attendees will receive a keepsake version of one of Fernandez’s poems, specially printed by the Palace Press. Other sponsors include the New Mexico Department of Cultural Affairs, Museum of New Mexico Foundation, and the Information Trust. Known in his country simply as “El Poeta,” Fernandez has an enormous reputation and a distinguished career as a poet, novelist, essayist, playwright, editor and diplomat. His works have been translated into French, Italian, Polish and English. His 2001 work, Parables: Selected Poems,featured an introduction by Margaret Atwood. He received the Premio Nacional de Literatura in 1996 for lifetime accomplishment, and formerly served as the Cultural Counselor to the Cuban Embassy in London. At age fourteen Pablo arrived in New York City from Cuba to attend school, where he studied English literature and by age seventeen wrote his first lines. By chance, he was taken to the home of famous writer Carson McCullers, who recognized at once that these lines were poetry. “You are a poet,” she told him after first serving him a potato salad whose illusive taste he has never forgotten. Pablo fled in tears. He felt misunderstood. His words, he insisted, were prose. How could this important writer with a play on Broadway call his work “poetry”? He felt that calling his work “poetry” was to disrespect it. Pablo went for comfort to his Cuban friend, Manila Hartman, then also living in New York City. “I’ve always told you, you were a poet, Pablo,” she said. Finally, she convinced him and he accepted his literary fate. Fernandez soon became part of America’s literati, returning to Cuba in 1959 after the revolution. Among his published works are the poetry books Salterio y lamentaciones (1953), Nuevos poemas (Nueva York, 1955), Toda la poesía (1961), Himnos (1962), El libro de los héroes (1962), Un sitio permanente (Madrid, 1970), Campo de amor y de batalla (1984), El sueño y la razón (1988) and Pequeño cuaderno de Manila Hartman (2000); and the novels Los niños se despiden (1968), El vientre del pez (1989) and Otro golpe de dados (1993).